On a recent Second Chance Garage road-trip, we found ourselves going through Dayton, Ohio, and couldn't resist stopping by "America's Packard Museum." 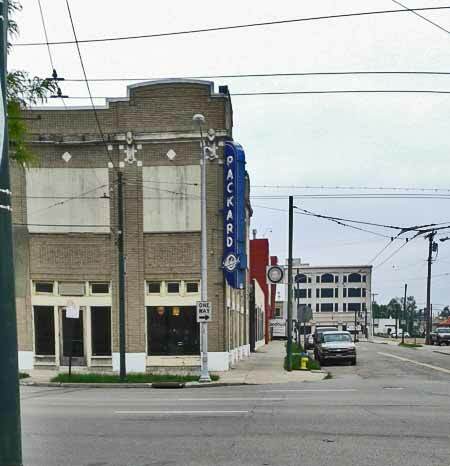 Located at 420 S. Ludlow Street in Dayton, the museum building is housed in a 1930s Packard dealership building built in 1917. The annex was added in 1935. The museum still has the dealership sign in the front, adding a little flair. 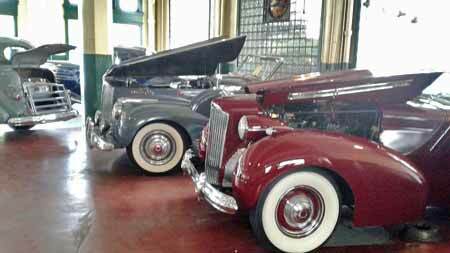 America's Packard Museum with original Packard dealership sign. Inside, you are greeted with, what else, but the original dealership show room full of Packards. Most of the cars in this room are 1920s and 1930s model cars, with brass era Packards and 40s and 50s cars at the attached annex. We were greeted by Dan Badger, director of the museum. He kindly showed us around and explained features and histories of some of the cars in the collection. 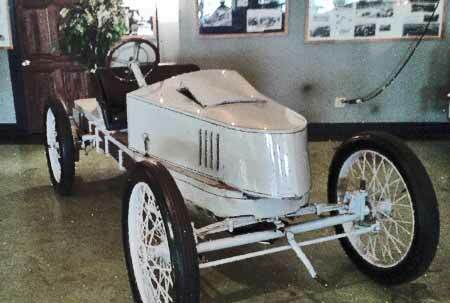 Noteworthy was the 1903 Model K Grey Wolf racer. It held the land speed record of 77 mpg at Ormond Beach, Florida. That in itself is interesting enough, but to give us an idea of what it must have been like setting that record, Dan tugged on the steering wheel. There must have been more than a foot of play in the steering wheel. Going 77 mpg on what was basically a buckboard with extremely sloppy steering took nerves of steel. Safety equipment? Forget about it! Packard Grey Wolf. How would you like to go 70 mph in this baby? 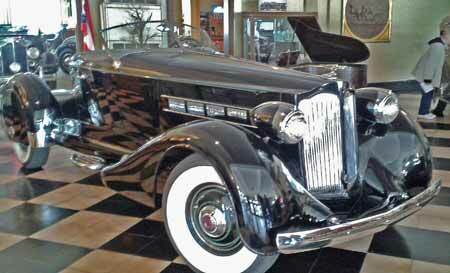 In our opinion, the classiest Packard was the 1936 Fernandez and Darrin bodied roadster. A slanted, V-shaped windshield and tear drop "steps" (Darrin hated running boards), helped make this car dazzling. This Packard speaks for itself. 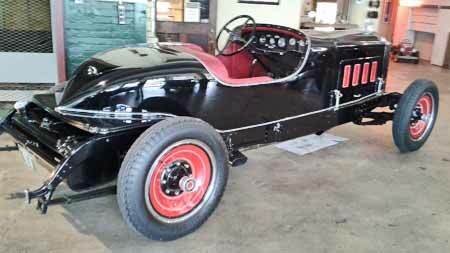 Another notable car was the 1922 Jesse Vincent racer. Basically a chassis with minimal body and little else, it was intended to be a test-bed for Packard engineers and a speedy showpiece for visitors to the Packard test track. In 1922, the car went to Europe for a few months, and was driven in races with high-performance European cars such as Bugatti and Mercedes. To get more power from the engine, engineers took the generator off and shoved a super-charger into the front of the car instead, thus, no headlights. The car could trave 130 mph and was rock steady. It has been driven by Wiley Post, Roscoe Turner, Charles Lindbergh, and Amelia Earhart, among other notables. Also in the museum is the 1948 Henny hearse used in the first Godfather movie; a 1937 car adapted to run on propane in 1939. It was a factory installation intended as a proof of concept in case the US entered the war and fuel was limited at home. Just a few of the Packards from the '30s. The '40s and '50s Packards are housed in the annex along with the brass era cars. 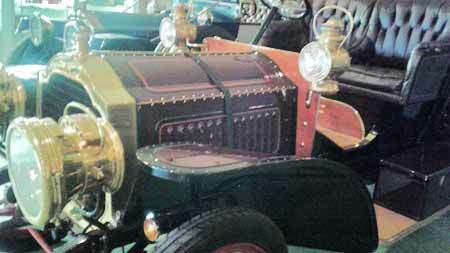 Detail view of one of the Brass era Packards at the Museum. We heartily recommend this as a must-see museum. The staff and docents are friendly and knowledgeable and the cars themselves are spectacular. 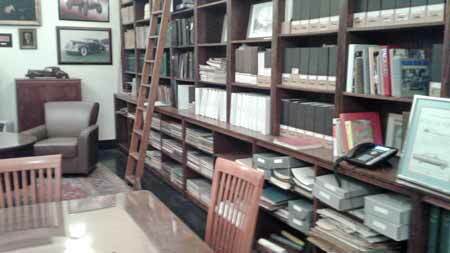 There's even a research library (complete with factory engineering drawings of the cars) for those seeking to learn more about the Packard.